The Caribbean state of Antigua and Barbuda has beaten the US in a dispute over internet gambling. The country relies on online gaming for much of its foreign currency earnings but was shut out of the US market by laws banning cross-border gambling. It took the US to the World Trade Organisation, claiming that the ban was designed solely to protect the huge US betting business - and won. The US says it will appeal against the WTO decision. The ruling at the WTO is only a preliminary one, and will now go to a seven-member appellate panel. "We... will argue vigorously that this deeply flawed panel report must be correct," said a US trade spokesman. The twin-island state's arguments, he said, ignored the fact that US commitments to open up its service industry were "clearly intended to exclude gambling when the US joined the WTO in 1995". The ban is based on a 1961 federal law originally designed to cover telephone bets, which prohibits gambling across state lines. A much more recent law passed by the House of Representatives seeks to it illegal to pay for internet bets using a credit card. The US bases its argument partly on the fact that online gaming is a haven for money launderers, and partly on fears that children might use their parents' credit cards to run up debts. But Antigua's high commissioner in London and representative at the WTO, Sir Ronald Sanders, said online casinos provided about 3,000 jobs at home. 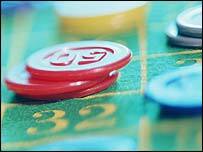 In any case, Antiguan casinos are only a small part of the US's online gaming problem. The General Accounting Office has estimated that there are more than 1,800 internet gambling operations, posing a tough challenge to law enforcement. Blackpool: The new Las Vegas?